…whatever tangible effect the sight of fresh blood has on an audience transforms depending on the circumstances & the way a fighter’s been hit or kicked. when we see blood there’s a visceral reaction that’s isolated to the instance that it happened. a hard kick to the head is something most wouldn’t bear with any steady composure—it’s a blunt trauma to the head, a quick opening of flesh & a drastic corporeal event. anyone who’s like sanchez has his reputation as a competitor to uphold & in this case he has to maintain the loss of the fight & the loss of blood. it’s easy know why he appears to be so calm, this is a way to carry himself as if he can handle anything his opponent hits him with, including the real possibility of losing consciousness that can be sustained & factored as what might unfold in the controlled chaos of the ring. it’s anyone’s guess what he tells penn after the blow, this pressured whispering could be be about anything, from a possible admission of forgiveness, to a declaration of vengeance. the adrenaline sustains his power, as does his will to overcome what would crush & humiliate the unpracticed. but he’s not anyone-else, he’s fought through this way of working, this hard-won occupation of his hazards this outcome & he must move on from here with an everyday situational reflection. the way he’ll recall this event will be an anecdotal way of recalling, aided by the media & absorbed into his healing body. his presence there was to get hit, kicked, compete & to fight, with the very open potential to win or lose. the fan packed arena tacitly asks for this, it’s a way of knowing that an acceptable brutality happened, a demarcation of the event, a brief marker of one night of fighting. the audience may not readily comprehend (nor care) why the red blood reflects their barbarity, but it also reflects the simple fact that he’s a living creature that’s been injured & the heroic struggle is mediated by the caprice, commerce & culture of this entertainment. at the very least, any entertainment on the border of vulgarity is to be questioned. it’s the recognition of a potential taboo that’s nothing to marvel at, yet we should at least recognize & respect his skill in the face of such pain. a way that violence is controlled here has to be noticed with the admission that it’s barely new, indeed it’s an ancient art, a gladiatorial sport that displays the fundamentals of conflict to rise above & to have that faith that one might win, without the death the romans called for, at least not in this instance. it too is held up in a slightly valiant light, but without any frill of poetic language—again he simply wins or loses, accumulates stats & earns what he can. the announcer flatly says “he’s as tough as nails, he’s one tough kid.” the support staff run to quickly mend him. first, the fighters maneuver to voluntarily create the trauma, then the team close in to fix it. the opponents break open the flesh, the others clean him & the wound. diego’s called ‘the nightmare’ yet, this isn’t a nightmare, it’s all expected, it’s planned for & it’s relished by the observers, this is the ‘money-shot’ to be sure. maybe it isn’t anticipated that he’ll lose, but it’s planned that he could lose. although he lost the fight, he still won his pride, he didn’t fall apart & god forbid that he should’ve lost his composure. none of this is unusual. the head bleeds profusely when it’s cut open. we observe the ease of trauma to expand on that which wasn’t meant to be opened up non-specifically. what matters, of course, is the event (a kick to the head), but also the transcendence into an idealized other-than-trauma. 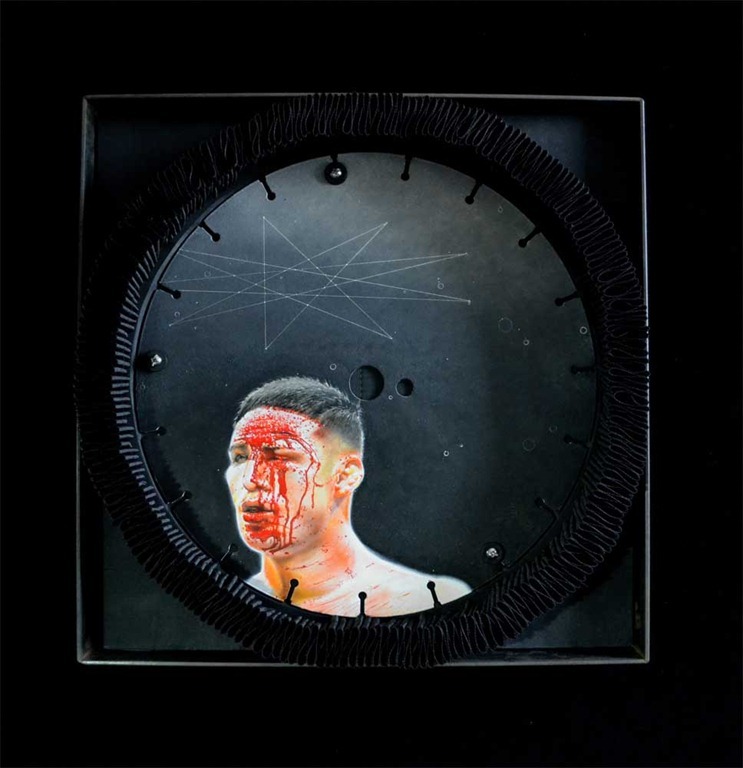 aurelio madrid / 2011-12 / diego sanchez / oil on masonary saw blade, steel frame, grosgrain ribbon, wood, fabric & fasteners. 16” x 16” x 2 3/4” (click to enlarge). an honorific object & a memorial to more than it was. we already know that wim delvoye created what looked like delft-ware onto saw blades before this. if handled correctly, a saw blade cuts into things (stone, wood, concrete &c.) in a controlled way—it’s a controlled violence. a way of slicing apart pieces that were once together & from there the job can continue. this violence is measured & it too can be weaponized. when the tool is dormant, it relies on its symbolic value to cut, it’s always still a potential, or a past fact that this was manufactured to perform up until it’s actually put to task. to methodically paint on the blade is to mark it in a way that isn’t typical & for this reason it changes what it was made for. its job becomes latent while retaining its identity as a blade to cut things. diego’s neck, head & shoulders depicted on this blade become a moment that was captured by a camera & now in oil. as in life his uncut face had to be there first before the blood violated it. this was captured in a way so as not to forget that meaning is manifold, circumstantial, & sometimes irrational. if we didn’t see (or don’t care) about the illogical parts of this unfolding, generous segments of thinking would be lost. our genuine loss is to assume a single fixed understanding about one thing &/or another. we throw ourselves in a disadvantaged place when we’re only looking for one way to narrow it all down. when we make this mistake, we whittle away prospective venues of exploration. the inscribed star polygon represents this kind of transcendence of form, all the way from the cut-open-flesh of the body, to the multiple idealizations one makes to ponder such matters. floating there above his head as thoughts run away with our indignation & our gratification. if it’s nothing more than a pure idealization, then it’s nothing more than the injured body. because this fighting match has passed, its breathless transience is universal. all must pass. if all must pass, this art eases into a memorial that’s a passage into the minds & eyes of its audience. a created memorial need not be an anodyne glorification, therefore it can be a studied recognition of things we can’t resolve. the end point is its desire to push beyond from what has been broken up, moving into what can’t be fixed. this brutal physical trauma has come to life in the lives of sanchez & penn, now the moment’s dead only to be revitalized in our minds. this recognized idealization itself is funereal. an after-the-fact composure of mourning for the steady loss of moments as they have washed away. gathered around these thoughts is the idea of overcoming what’s been taken from our lives in this & the simple un/changing rushing of time. this biting & voracious temporal consequence is something to mourn for & it reminds us of our own potential for growth. none of this is about reactionary closure. the closure of truth resides in its stillness as it’s sliced open. we mend the wounds & clean up the blood all the while knowing that we can’t overcome without strife. …& this art contains my suffering. luctor et emergo. 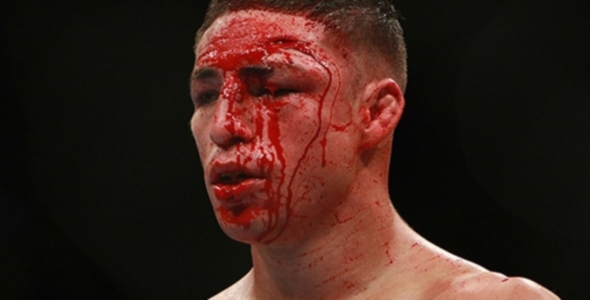 …& thanks to dave mandel (from sherdog) for his permission to use his photo of diego sanchez for this art-work.